Be standing out between hundreds of boats cruise across every day, discover the... Read more! 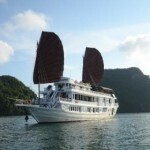 Paradise Peak Cruises has been launched on Jan 01st, 2012. At that time, the luxury... Read more! Paradise Luxury I, II, III & IV were built according to the traditional Vietnamese... Read more! Officially open on 18 December 2007, our newest four star junk set the standard for... Read more! 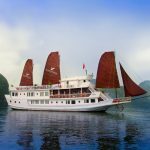 Launched on November 2009, our newest five star junk – the Halong Violet – fitted out... Read more! Backed by over ten years experience hosting international guests on the tranquil... Read more! The luxury junk named Valentine set its first voyage in early Oct 2007. The Valentine... Read more! 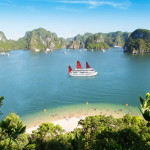 Halong Bay Viet nam is a legendary world just waiting to be explored. Bhaya Cruises... Read more! The Au Co cruise itself was designed by the Industrial Ship Designing Institute and... Read more! The first idea of founding Victory Star Cruise made Bai Tho - Management Board... Read more! In our Oriental culture & Spirit, the Flamingo is a one of the totem animals... Read more! 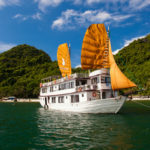 Visiting Bai Tu Long Bay with customized services, only one lovely suite and friendly... Read more!